Add a touch of true class and luxury to your bedroom or living space with this tri-paneled standing mirror. 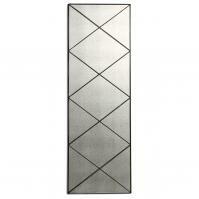 The mirror measures about 62 inches by 80 inches and features multiple panels within a metal frame. 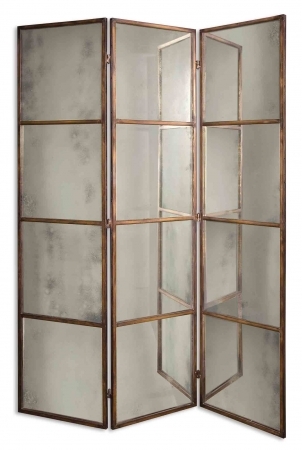 The frame is finished in antiqued gold leaf for a rich addition to your room. The uses for this mirror are almost endless. Create a privacy dressing screen in your bedroom, use it to partition off a home office area in the living space or set it in the dining room simply to add a gorgeous style element. The mirror weighs in at 172 pounds. Material: Plywood is made by gluing together multiple layers of thin sheets of wood to achieve the desired thickness. Used in the process of building for roof sheeting, wall sheeting, and sub floors. Usually comes in a 4' x 8' sheet in a variety of thicknesses.